in theres turist-company in Spain. They are planing some similary trip later. It will be updatede here. Kjartan Solvang Nielsen and his wife Grethe have written this letter in Norwegian, but speaks excellent Danish and English. Webmaster has tried to translate it into English. in Valby CultureHouse pm. 14.00. Refer to meetings and events (in Danish). In 1996 they got a call to restore the Salvation Army in Nakskov on Lolland, which succeeded for several years. He has previously been our guest speaker several years ago at Herlev Kro, (maybe some of you remember it). Now they have been to the FGBMFI meeting in Valby Kulturhus. There were over 100 people 'present and Kjartan speech was good and inspiring. There were many who got something to think about regarding revival. Thank you Kjartan. There were so many who went to intercede with them. Let us pray that those prayers come true, so the revival can start. Pray also for their onward journey and revival underway ..
they should run on. These bikes were in Spain and named exactly Rock Rider. many churches, house churches and Christian homes as possible. On May 9 start our calling-trip ! We will cycle from Kongsvinger to Spain and the goal is to visit so many churches, house churches and Christian homes as possible on our dedicated way through Norway, Denmark, Sweden, Germany, France and Spain ! It is a visions-trip where we will proclaim His power and grace, encourage new strategies and equips God's people for a time of revival . Many have said that 2014 is the year of revival. We think they are right and we want to encourage God's people ! 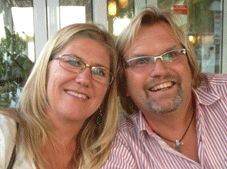 Liv Grethe (45 years old) and Kjartan ( 48 years old ) Solvang Nielsen has 18 years of experience in the Salvation Army many years as church - planters and entrepreneurs in Norway and Denmark . In total we have experienced strong service, especially in the nineties in Denmark, but also in the following years as evangelists with sermons in Norway, Denmark, Sweden, Iceland and Spain. The last ten years we have discovered that God's church is much larger outside than inside the church walls, and we called ourselves the " priests of the church resolve . " We also run our house church and come in several church bodies . We begin the journey out from our latest entrepreneurial project for the Salvation Army in Kongsvinger and continues downward. There are concluded a few agreements until now, as the project came suddenly after a strong calling-experience, but set some dates in Norway and Denmark . Some know us already , while others have never heard of us. We have a strong calling and distress to the unsaved . For fifteen years, a dream of awakening and repeated prophecies of our lives, that we can no longer resist, prompted us now to travel in obedience. We get our inspiration from God's Word, but also some Christian writers and theorists. In a class by itself is books like Ed silvoso "To no one will perish ," and " Prayer Evangelism " , Jonathan David , " Apostolic strategies that transform the nations" and Wolfgang Simpsons, " Home , which transforms the world." Other books that have meant a lot to us , Tommy teeney , " Hunt for God " and John Ortberg , " If you want to walk on water , you have to get out of the boat " ! Our desire is not to provide definitive answers, but to put God's people in motion. We want the church to be like the first time, a movement full of power, love and grace. We want the church should no longer be the same as a building for ceremonies or judgmental statements in public. We do not believe that the church is a house, but God sees a church in every place, a people, regardless of theological differences or class differences. We do not believe that everything must be revolutionized and changed, but rather that we as God's people, let us change us, just as the Holy Spirit leads us to it. We have seen God's Spirit move before. We believe 2014 will be the year when a lot will change, but we must turn to the Holy Spirit who gives life ! We hope you will share this vision with us and look forward to hearing from you as soon as possible .